Is it too early for the Victorian Flower Oracle? I think not. This deck belonged to a late crone of our women’s group, so it’s always a bit bittersweet to use it. However, our crone could hit the nail on the peg quite well, and sometimes so does her old deck (well, one of HUNDREDS that she had LOL). 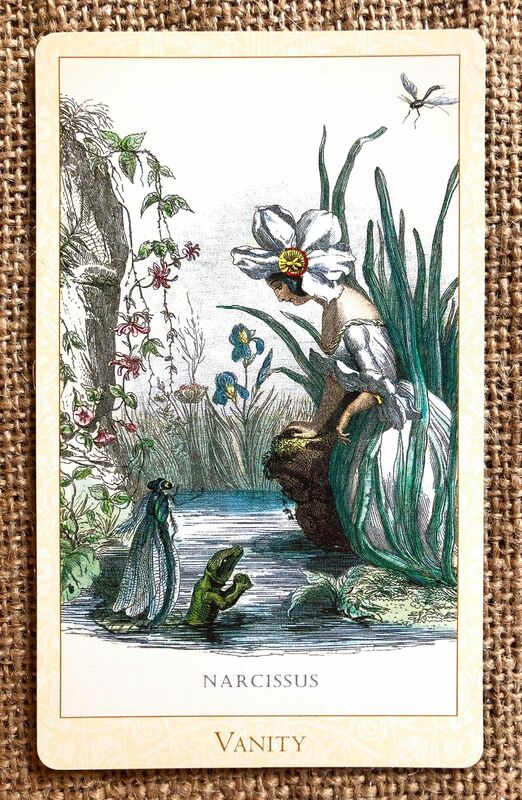 Meaning: Grandville’s Narcissus goes longingly at her own reflection in a pond. The original Narcissus in myth was a Greek youth famed for his physical attractiveness and self-absorption. Many young women fell in love with him, chief among these bing Echo. Echo wanted to be noticed by Narcissus but he was too, well, narcissistic to notice anyone but himself. Echo pined away to such an extent that she ceased to be human and become a disembodied whisper. She called upon the goddess Nemesis to avenge her. Nemesis responded by making Narcissus fall in love with his own reflection. He knelt by a pond and gazed and gazed and could not be pulled away. Finally, he died. The flowers known as narcissus (daffodil to some of us) sprung up at the site of his death. Why the fascination with the story of Narcissus? Certainly, vanity has been condemned by moralists since the start ofttimes. But why shouldn’t we love our own image? One unfortunate result of such moralizing is that many people actually dislike themselves and will hardly look at their reflection at all. Rather, they shrink from it. This is sad. If we have been blessed with reasonable features, or even if we haven’t, let’s enjoy our own faces. If this card comes up in a reading, ask yourself how it relates to your life. Does it refer to someone close to you, or is it suggesting that you yourself are the vain one? Or – and this is a real possibility – could it be that you need to consider yourself more, not less? Vanity is unattractive, but sometimes self-regard is no bad thing.